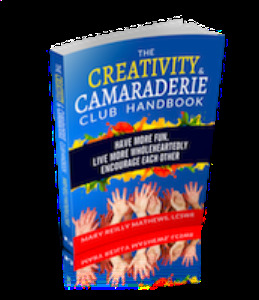 I highly recommend this book to anyone seeking to expand their creative horizons —After reading it and then becoming a member of a Creativity & Camaraderie Club I found that I am a lot more “creative”, “fun” and “talented” than I ever realized !! !–This book is well written and easy to read : yet it has an intellectually challenging side inextricably intertwined within it— I guarantee you won’t put it down once you turn the first page. …..It’s unique concepts and content help you uncover the true meaning of the word “creative-ness” — and the vast potential that you’ve got hidden away in yourself and have yet to discover . I have truly grown and expanded my horizons after reading this book and applying it’s ideas in my life. It has succeeded in getting me to look forward to each and every day in exciting anticipation……great book. -Judy M.
Start having more fun yourself now! If you have ever wanted to satisfy your urge to learn to do something new, read this book… As a librarian I think every library needs to get a copy of this book. And any library can host a Creativity & Camaraderie club as a gift to their community. Ann S.
The whole time I was reading this Handbook I kept thinking: OMG I want to be in this group! I also kept thinking that I am not very creative and wouldn’t have anything to share…then I had a dream that I was painting! Let me mention here that I’ve never painted anything other than walls & woodwork in my entire life. The handbook inspired me to buy a canvas and brushes and oil paints and off I went! It was liberating! It was so relaxing and fun and … creative, who knew? Anyways, getting back to the Handbook. It is a very useful guide for anyone who wanted to start and maintain any kind of organized group. The Handbook was easy to follow and included checklists, websites and appendixes that are not only very helpful but inspiring as well. Debra B. After being exposed to the expanded definition of creativity my creativity club supported, I now view my entire day through the lens of “what am I creating here”? I no longer “clean”, I create order. I no longer “do lesson plans”, I create learning opportunities for kids. I no longer “pay bills”, I create financial security for my future. I no longer “go clothes shopping”, I create a fun new wardrobe. I’m a dude – and I dig this. I wish these ladies would invite me to their meetings. Join Us! Start creating community now!